Mallard’s Magnum Wheel Pallet Flow is no ordinary pallet flow rack. The difference (of course) is in the wheel. Magnum wheel pallet flow was created to withstand the toughest and busiest warehouse environments– food processing, grocery, cold storage, heavy manufacturing and automotive. Typical pallet flow rack wheels are made of standard polycarbonate. The Magnum wheel is made from extremely rugged, reinforced resin that holds up under harsh conditions without splitting or cracking, saving you hefty replacement costs and pallet racking system downtime. Magnum’s wider surface area is better for heavy or difficult pallet tracking and supports twice the load of standard wheels. The best proof of Magnum’s staying power is on the plant or warehouse floor. This Mallard customer and major US dairy processor purchased a Magnum pallet flow rack system in 2011. Mallard is so confident in the superior strength and durability of the Magnum wheel pallet flow, it comes with a Lifetime Abuse Warranty. 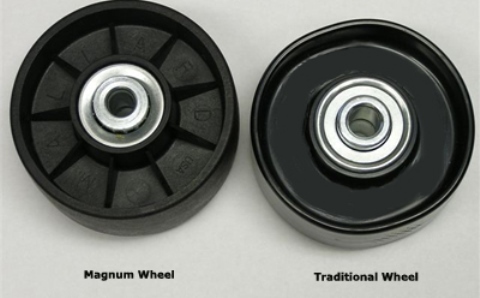 For a closer look and additional specifications, see our Magnum Wheel Comparison Page. If you’d like to talk to us about your system needs and to see if Magnum wheel is the right choice for your application, give us a call!